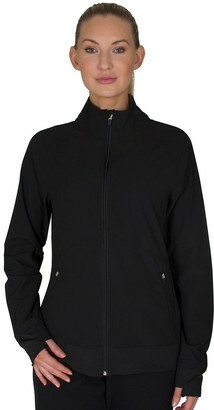 PRODUCT DETAILS This women's Jockey scrub jacket combines fashion with unbeatable comfort. PRODUCT FEATURES Snap front Long sleeves 3 pockets Back princess seams provide flattering fit Soft, stretchy knit cuffs FIT & SIZING 28-in. approx. length from shoulder to hem FABRIC & CARE Polyester, rayon, spandex Machine wash Imported Promotional offers available online at Kohls.com may vary from those offered in Kohl's stores.